All riders must register by June 2nd! 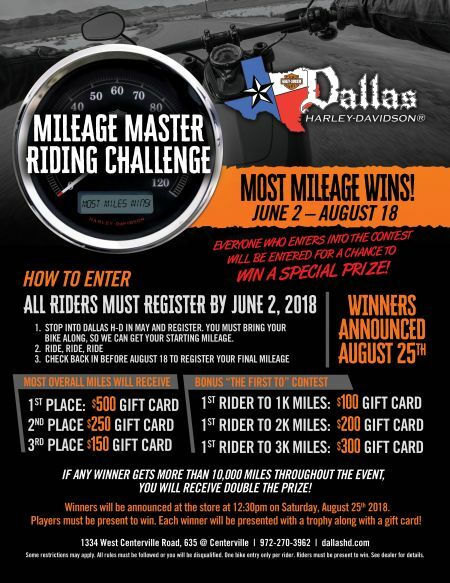 Stop into Dallas H-D in May and register. You must bring your bike along, so we can get your starting mileage. Check back in on or before August 18th to register your final mileage. Winners will be announced at the shop at 12:30pm on Saturday, August 25th during the ‘Winner’s Circle Party’ from 11am-2pm.Players must be present to win.Each winner will be presented with a trophy along with a gift card! Earn bonus miles by attending events during the Challenge period! Check our Facebook page for updates!